I saw a baby raccoon by itself! 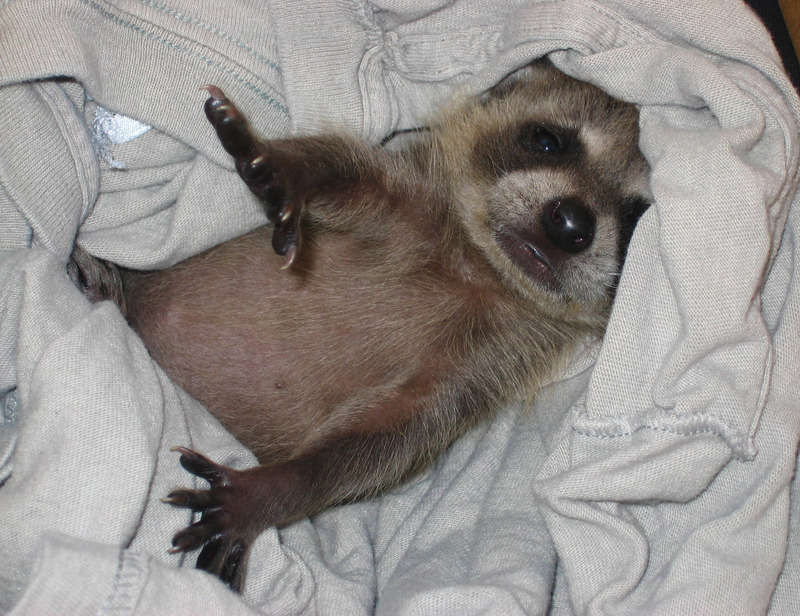 A baby raccoon should never be out of the den by itself. A few exceptions may be an inquisitive juvenile that ventures to a puddle of water or to the base of the tree while the mother is napping. Typically, when you approach, the juvenile will run to the den where mother is present. If the baby does not lead you to the den, it is orphaned and requires rescue. If in doubt and the baby is not in distress, place an inverted laundry basket to contain and wait a couple hours to see if mom retrieves the baby. If she does not, contact the hotline or a raccoon wildlife rehabilitator. The kit is continually vocalizing. You are aware that an adult was trapped or killed in your neighborhood. Babies will begin to leave the den 24-72 hours if mom does not return. An adult wearing gloves should gently cover baby with a T-shirt, pick up and place in a secure box or pet carrier for transport. Proceed to our “QUICK TIPS” for additional rescue instructions. I found an injured or orphaned raccoon! A sick animal needs to be removed by your city animal services and euthanized. Distemper is not curable. As the sick animal lingers, it spreads the air borne virus. Animals with distemper can spread it to others 12-15 feet away. Removal protects the rest of the wildlife. Most wildlife rehabilitators do not have the resources to euthanize for the public, as well, do not want to introduce viruses to the animals in their care. People cannot contract distemper. 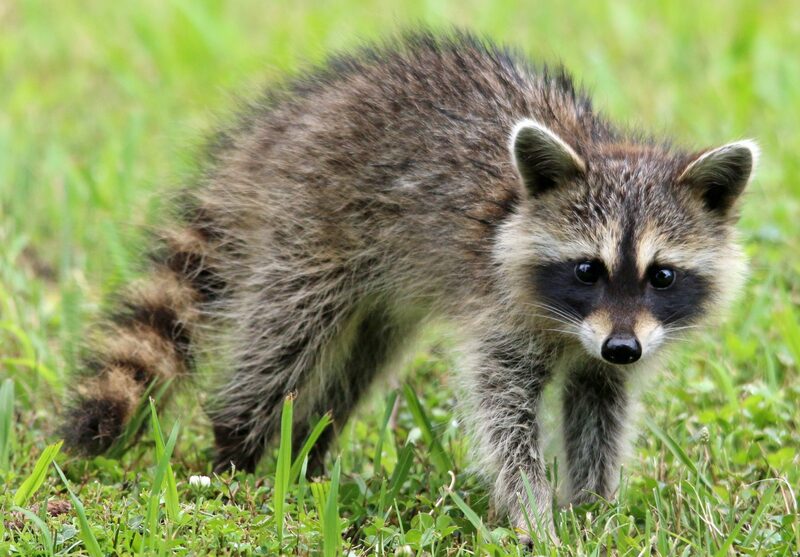 How to humanely evict a raccoon and or raccoon mother with kits. 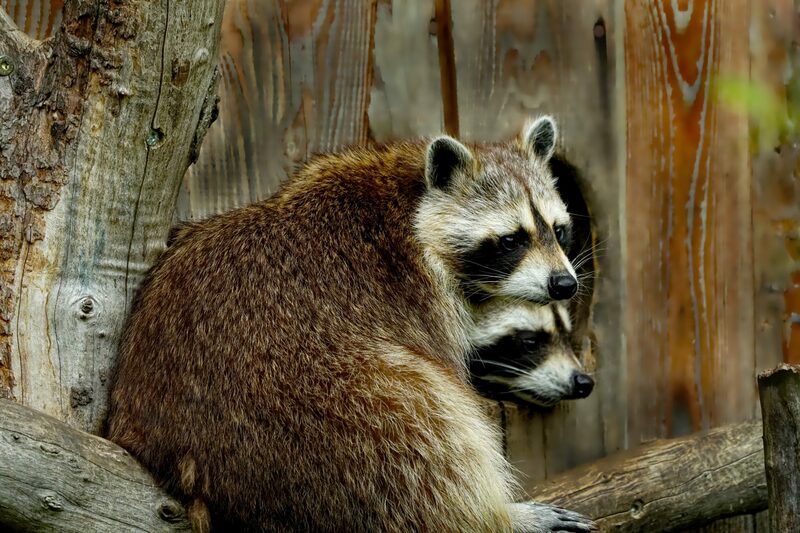 If you have a raccoon occupying your yard, under the deck, storage building, in your attic or chimney, it is easy to encourage them to relocate. Often the homeowner is unaware of babies, until they have already trapped/relocated the mother raccoon. An inexperienced or stressed mother may (when trapped) eat her babies. 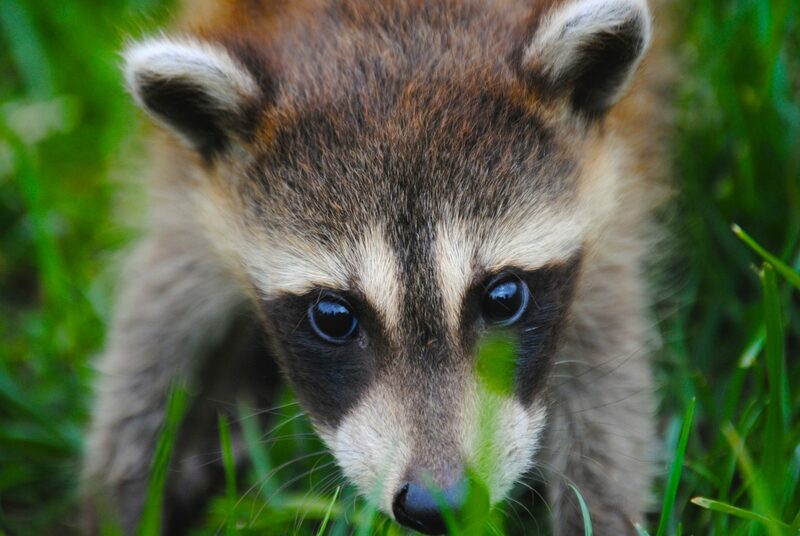 The raccoon is a single mother as the male will kill the kits. Territorial animals rarely survive relocation, especially a wild mother with babies. Stress of relocation or lack of mobility of the young may cause her to abandon the young. The resident wildlife may feel threaten and kill the defenseless young. Relocation contributes to the spread of disease such as rabies, canine distemper or panleukopenia. There are state laws restricting the relocation of raccoons within 10 miles. Allowing the mother to relocate her babies prevents the homeowner from having additional cost associated with cutting into walls to retrieve the babies. It is much cheaper to let mom get in those tight places and move the babies. Often the discovery of the den is enough for the mother to move her family. If it has been a few days since you discovered the family, some encouragement may be required. An eviction is a simple solution. Requires no relocation. Family will remain intact. The use of deterrents encourages the raccoon to vacate by disrupting the quiet, dark den. Eviction is the most humane solution and wild babies stay with their mother. FIRST, to evict identify where the raccoon is gaining access to your home. Inspect for damaged vents, soffits, and or flashings. The entry may have fur around the edges. An eviction must be deployed at dusk. This is when the mother becomes active and leaves the den to hunt. Upon leaving the den, if she feels a threat to her young family, she will begin relocating. This may be immediately, take one or two nights, depending on the size of the family and the mobility of the babies. A special note, if there are adverse weather conditions that may limit the mother’s activity, wait to begin the eviction as you do not want the mother to become accustom to the deterrents. Deterrents target the senses: sight, smell, and sound. The deterrents (light, radio, and Apple Cider vinegar) are turned on at dusk and off at day break. Do not leave on during the day, as the mother will get accustom and determine there is not a threat. Day one at dusk, provide light to the den. Depending on the location, you may need to use additional lighting such as a utility light with a clamp (extension cord, if needed) to flood the den site with light. Mothers prefer a dark den. Add a portable radio on a 24-hour Rap music or Talk station at the den, creates an additional threat to the family, as the preference is to have a quiet den. On the morning of day two or three (depending on when you believe the family departed) turn the deterrents off. Seal the entry of the den with newspaper, plastic garbage bag taped to the edges, or other barrier that can be easily removed by the mother if she is still in the den. The purpose is not to trap. The goal is to determine if the mother is still using the den. Monitor for activity for 24 hours. Listen for babies as the mother can’t be at both den locations. She may have partially relocated the family. If after 24 hours the opening is still sealed as you left it, proceed with permanent repair to prevent another raccoon or wild neighbor from taking up residency. A minimum repair would entail hardware cloth applied to the opening and secured with a 1-inch sturdy staple. For a chimney install/reinstall a chimney cap. If the den site was under a deck or building, secure by constructing a “L” shape barrier of hardware cloth. The horizontal of the “L” will be at a 45-degree angle away from the structure at least 12 inches in width and submerged four to six inches. An animal that typically digs to gain access will quickly be discouraged from this barrier and will move on. Pier and beam homes check your foundation vents and replace with a sturdy hardware cloth to prevent entry. Don’t kid yourself that another animal won’t occupy the abandoned den! Follow through with the repairs. To discourage wildlife on your property read FAQ, “Basic Conflict Resolution of our Urban Predators”. I want to hire someone to remove a raccoon and or a family of raccoons. What should I consider? Considering a wildlife removal company, be an informed consumer. Ask questions. Ask how they intend to trap the animal. Will it be specific to the target animal(s) location? Be wary if the trap is just located in your yard. Any animal can walk in the trap, most likely won’t be the animal you are targeting. What will they do with the trapped animal? Most of the urban wildlife trapped are territorial. Relocating to another animal’s territory compromises the ability to survive. What will they do with babies? Will they donate to the wildlife rehabilitator? What form of euthanasia will they use? What is the state and city laws regarding the wildlife and or its’ relocation? How can a mother survive with her babies when relocated? When considering a wildlife removal company, please ask questions. They will gladly take your money. However, will they prevent orphaning or inhumanely killing the removed animal(s). Relocation sounds humane; however, studies reveal most animal’s do not survive and it is next to impossible for a mother with babies. If they are taking the animal(s) to rehab, will they make an appropriate donation. It is very difficult for rehabilitators to say no to these babies in fear of how they may be disposed of. Be an informed consumer, ask questions or you may call the hotline for referral of a humane exclusion services. Read the FAQ’s on eviction, how to discourage wildlife and many other topics. Most conflicts can be resolved without hiring a wildlife removal company. Call the hotline with your specifics and we will be happy to advise and empower you. The following video shows removal of a raccoon family by a trained humane exclusion company. Adopt the lawn care recommendations. Encourage those insect eating birds. And if needed the products recommended to reduce the digging activity in your yard. Remember the wildlife are beneficial in keeping our rodent populations under control..
To gain insight on the raccoon and its intelligence view this documentary.